Mother’s Day is just around the corner. It’s a day when many of us reflect on how our mothers, grandmothers and other special women have influenced our lives. I’m no different. 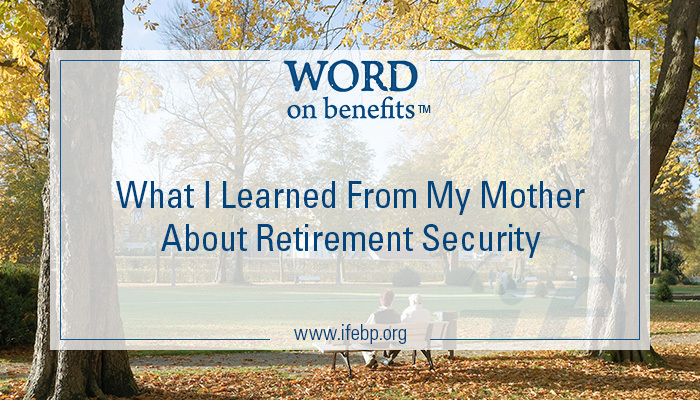 As I worked on the recently released International Foundation report, The Path to Retirement Security in the U.S.: How Employers and Plan Sponsors Can Help, I thought a lot about how my mom’s life experiences shaped the person I am today and my personal retirement security. Here are a few of the many things I learned through Mom. Don’t assume you’ll be able to work as long as you want. For more than 40 years, Mom sewed nightwear and sportswear in one of the many garment factories that used to dot south-central Pennsylvania. At age 62, she retired. For financial reasons, she really needed to keep working—but her limited job skills and the shifting of garment factory jobs to other nations made this impossible. Living on Social Security with no other income is tough, if not impossible. Mom’s pay during most of her working years was near minimum wage. Her income was such that she couldn’t set aside money for her later years, and there was no employer-sponsored retirement plan. When she retired, her Social Security benefit based on her earnings wasn’t a lot of money, and paying for Medicare Parts A, B and D took half of her monthly check. While she had managed to purchase a home and pay off the mortgage just as she retired, stretching the remainder of her Social Security check to cover property taxes, food, utilities and other expenses truly was a stretch. Don’t assume Medicare will pay for long-term health care. Near the end of her life, as her health declined, Mom could no longer live on her own. I’m grateful that, for a time, she was able to live with my husband and me. But eventually she needed long-term care. Because she lacked retirement savings and had limited income, her nursing home options were limited. For most people, a satisfying and financially secure retirement requires an employer-sponsored retirement plan AND taking responsibility for saving on one’s own. Unfortunately, statistics reveal many others are experiencing the same challenges Mom faced. With changes in Social Security benefits and the shift from defined benefit to defined contribution plans, the problems are predicted to become even worse. An increasing number of people say they plan to work beyond the “normal” retirement age of 65. Of these, four in five report they need the money to make ends meet. But data suggests only one in four of those who want to work will actually be able to do so. 1 For some, like my mom, skills are outdated or jobs no longer exist. For others, it is a matter of poor health or the need to care for aging parents. I’ve also discovered Mom wasn’t alone in depending so heavily on Social Security. Read the Foundation report and you will learn one-fourth of those receiving Social Security benefits have no other retirement income. For three out of five beneficiaries, Social Security provides 90% or more of their retirement cash income. 2 Persons with limited education, low income and no workplace retirement plan are among those especially at risk of total dependence on Social Security. Mom didn’t have the stress-free “golden years” we all dream about. On the other hand, with the help of friends, family and government programs, she was spared some of the worst retirement scenarios I have heard about over the years. Most importantly, Mom’s experiences taught me how essential the combination of a workplace retirement plan and personal savings is to a personally satisfying, financially secure retirement. Please invest a few hours of your time reading the Foundation’s report on retirement security and consider how you as an employer, plan sponsor, plan administrator or other benefits professional might help future workers experience a better retirement. You will find background information that will increase your understanding of why we are experiencing a retirement crisis in the United States, the implications for both workers and employers, and a vast array of strategies being used successfully to tackle the problem.